Coffee with cream & sugar ingredients: Water, 100% roasted Arabica beans, 18% cream (milk, cream, sodium citrate, sodium phosphate, carrageenan), sugar. Coffee with milk & sugar ingredients: Water, 100% roasted Arabica beans, 2% milk (Partly skimmed milk, vitamin A pal mitate, vitamin D3), sugar. Nutritional information was obtained through analysis by our nutritional software, entitled ESHA Genesis R & D Nutritional Software, and information provided by suppliers. All nutritional information is based on 6" gourmet subs and standard ingredient servings, unless indicated otherwise. The nutrition information contained in this section is based on standard product formulations. Variations may occur due to differences in suppliers, ingredient substitutions, recipe revisions, assembly at the restaurant level, and/or the season of the year. Certain menu items may vary from store to store and may not be available at all locations. The nutritional information provided in this section includes a selection of Country Style's most popular items. It may not include all products found in-store. Information may be subject to change at any time. 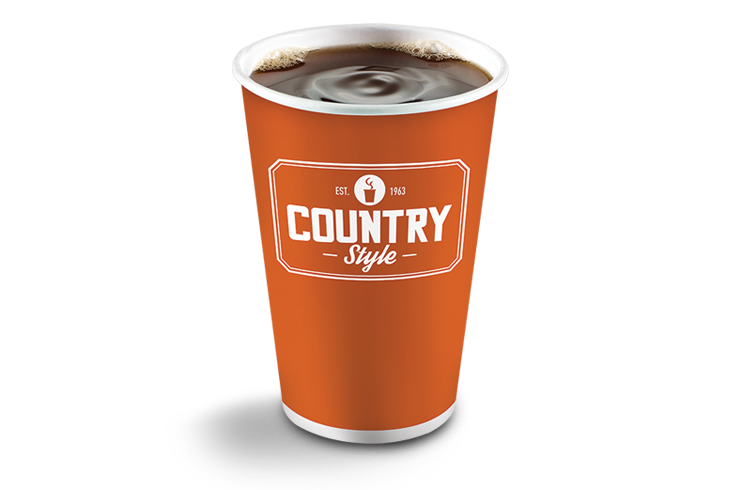 Country Style is a division of MTY Group Inc.